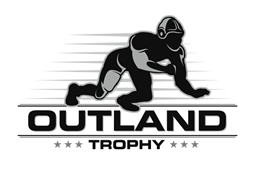 Since the Outland Trophy winners from 1946 through 1987, did not receive the authentic Outland Trophy, Downtown Rotary Club of Omaha has presented Authentic Trophies to the following past recipients: George Connor, Notre Dame, the first recipient (’46); Joe Steffy, West Point Military Academy (’47); Bill Fischer, Notre Dame (’48); J.D. Roberts, University of Oklahoma (’53); Mike McGee, Duke (’59); Bobby Bell, University of Minnesota (’62); Loyd Phillips, University of Arkansas (’66); Ron Yary, USC (’67); Larry Jacobson, UNL (’71); Rich Glover, UNL (’72); John Hicks, Ohio State (’73); Randy White, Maryland (’74); Lee Roy Selmon, University of Oklahoma (’75); Mark May, University of Pittsburgh, Ross Browner, Notre Dame (’76); Jim Ritcher, North Carolina State (’79); (’80); Dave Rimington, UNL, (’81-’82); Dean Steinkuhler, UNL (’83); Chad Hennings, Air Force Academy (’87), and the previous one to Greg Roberts, Oklahoma (’78). 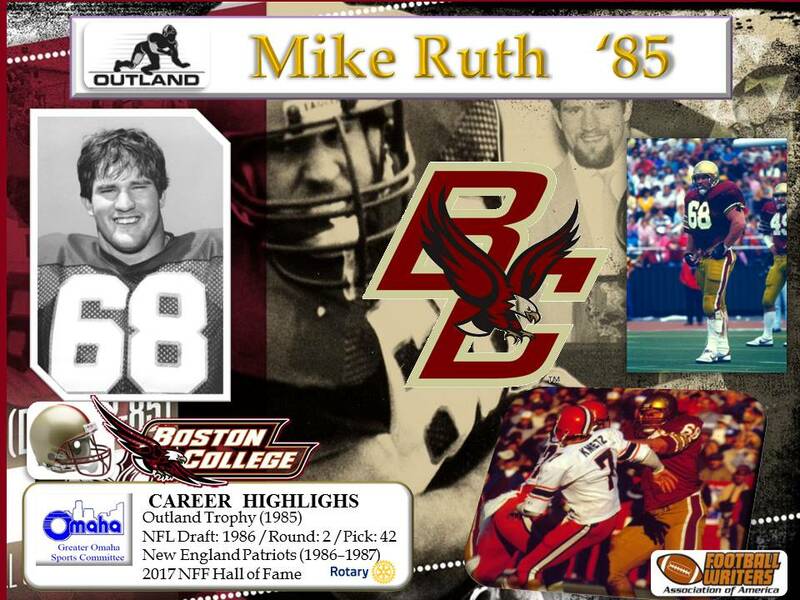 Mike Ruth is the only Boston College player ever to win the Outland Trophy, presented to the nation’s best interior offensive or defensive lineman. Though his team had a losing record, Ruth was honored in 1985, the only time a player from a non-winning team has been honored. 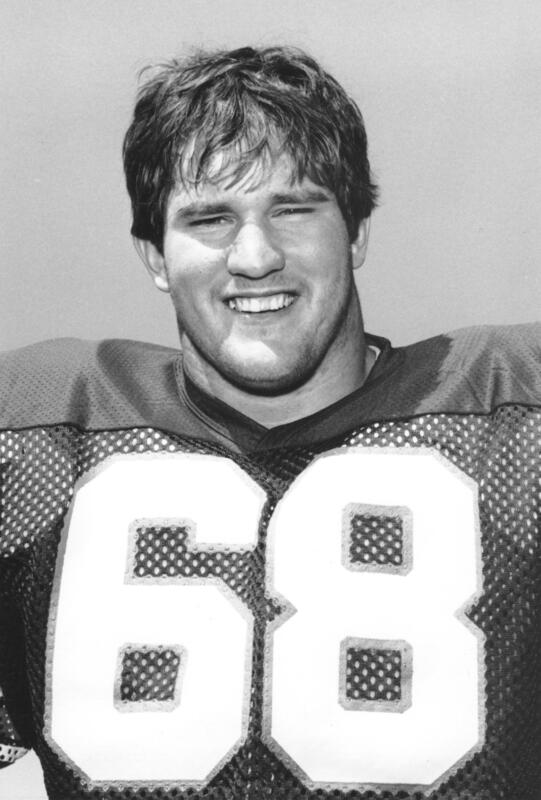 Ruth had built a tremendous reputation during his junior season and really secured the Outland Trophy in the 1985 season’s first game, the Kickoff Classic against Brigham Young University at Giants Stadium in New Jersey. He relentlessly harassed BYU’s quarterbacks the entire game, convincing the trophy’s voters that he still was the country’s best interior lineman. His play for the rest of the season did nothing to diminish that impression. Ruth showed as a freshman during the 1982 season that he would be special when, playing a backup role, he accumulated 36 tackles and three quarterback sacks. Though dogged by a season-long ankle injury as a sophomore in 1983, he more than doubled his tackles to 80 and had 7.5 sacks. In 1984, as the key to the Eagles defensive strength, Ruth had 102 tackles, 76 of them solo. He had 6.5 sacks, but also was credited with 20 quarterback pressures and seven other minus-yard plays. In the 1984 game against Holy Cross, he pressured the Crusader quarterback into throwing five interceptions. Away from the field, he was just as unique. For most of his time at BC, he seriously considered a vocation to the priesthood. He was a very value-oriented person who practiced what he preached. Often, the night before a game, the team would watch a movie he found objectionable and he simply sat outside the meeting room where it was being shown, and studied. When his teammates emerged, he rejoined them for the team’s late-night snack and everything was very comfortable for all concerned. At 6-1 and 265 pounds, he not only was the team’s strongest player — he had a record 560-pound bench press as a junior — but he also was the quickest lineman. He mauled the offensive linemen who tried to block him, often tossing them aside like rag dolls; or he fooled them with his cat-like quickness that helped him elude double teams by centers and guards until it was almost monotonous to watch. The combination of his strength and quickness helped him accumulate a couple dozen sacks and nearly 300 tackles during his career. Injuries once more dogged him as a senior but not enough that he didn’t excel on a team that won only four of 12 games. His mother was a victim of severe arthritis, so bad that at times she could not walk down the aisle in his family’s parish church outside Philadelphia. No matter. Mike simply picked her up in his massive arms and carried her to her pew; and when it came time for her to receive Holy Communion, he carried her to the altar and back again. 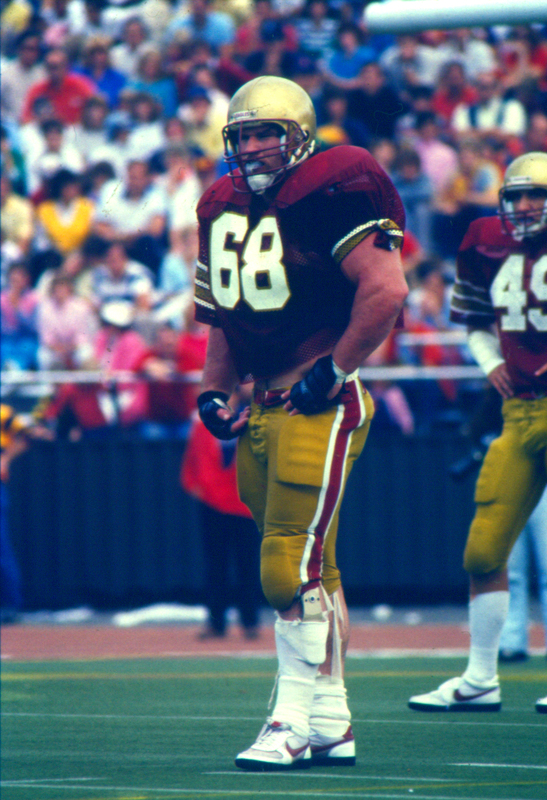 He was team captain in 1985, his Outland Trophy year, but his leadership, even in a losing season, remained true to his personality. He told everyone before that season that he was not a holler guy, that his leadership would be by example. He never wavered and played as intensely as he had the previous seasons. Ruth came to BC from Norristown, Pa., where he graduated from Methacton High School. He was a third-team all-state pick and was the team captain. 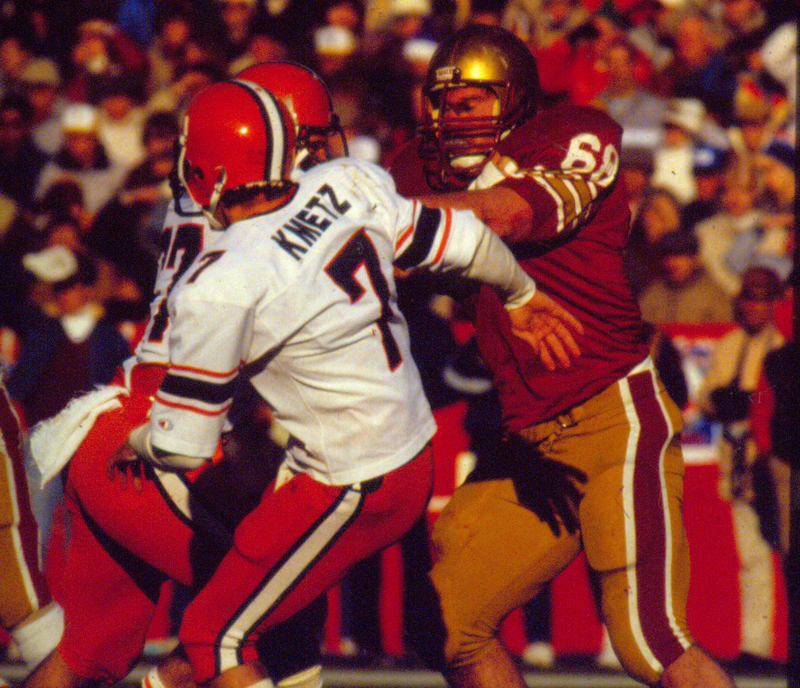 After his BC career, Ruth was a second-dround draft pick (42nd pick overall) of the New England Patriots and played for the team in 1986-87.
for a Game that is won or lost in the trenches. The One that rises to be the best, the unsung hero, the Outland Winner!